I need a Home page design for Taxi website based on style of websites we already have designed. We need it to be clean, modern and light. Website main body width 1180px. Design width - we would like it to see in 1400px, that way we will be able to see how background or images will be stretch. 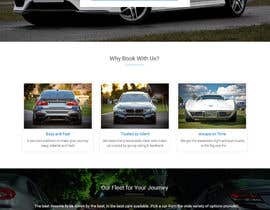 - Our fleet section - displaying a background image of a car and some text on it or bunch of small images with title under each. - Footer - bunch of links in two rows 5 each, small contact form, social media, copyright, design by. Here [login to view URL] you can find some of the website we have created, use it as guideline but also dont feel too constrain. Other examples you can find by searching google UK for taxi companies. If you have any questions please let me know, we are here to assist to make it easier for you to grasp what we need and to make sure it is good design. We create few taxi website every month so for successful designer it can be more work. Many people observed " saurmathur " before, cause when something goes reverse him, that person try to harass others. Like example:: If in a contest design concept , structrue, wireframe Given by Contest Holder which means every design structure may be close to same. In that condition, our many community perosn observed that, in most of contest before his entry rejected / poor rating, he never speak about copy.But after reject his enry, he started saying that, everything is copy....WHY??????? He is really a trouble maker & distrubed person. His attitude not like professional. So guys plz careful about " saurmathur ". What is function of the google translator in header? I need a template for website for my client website, can be IPG but done properly, PSD would be an advantage. And need to redesign Home page only?? what should be the final output? ony PSD design for Home Page?? how about the navigation it same to the link that you mentioned?